Anyone who’s ever tried to convince their skeptical friend of that one, irrefutable UFO case knows how frustrating it is to run up against that brick wall of denial that is the the “mass hallucination” theory. The theory is that collective observations of anomalous phenomena can be explained by positing that all witnesses experienced the same, or similar, hallucinations at the exact same time, without any physical stimulus being present. The problem with mass hallucinations, though, is that they don’t actually exist - at least not as we understand them. Although tossed around in everyday conversation, there is hardly any mention of mass hallucinations in the scientific literature. Some have speculated on the possibility, but there is very little scientific basis for the idea that multiple people could individually generate the same visual imagery and auditory information. But as blogger Douglas Mesner has noted in an excellent critique of the mass hallucination concept, a few scholars have suggested that it might be possible for crowds to agree on the details of a collective observation, even without everyone observing it for themselves. (2) This concept is sometimes referred to in the literature as a “collective hallucination,” although this concept too is poorly supported. ​In 1895, Gustave Le Bon suggested that people in crowds are liable to enter a kind of hypnotic, and highly suggestive trance state, priming them for hallucinatory experiences. (3) Once someone suggests the presence of something - a sign in the sky, for example - then everyone else naturally accepts it’s presence. Enough people would succeed in hallucinating the image to create a convincing frenzy, and everyone else would just buy in to the hype, even without seeing the thing for themselves. Le Bon saw the crowd as more than the sum of its parts. Group association tended to diminish capacity for individual thought and reconcile witnesses' conflicting observations. 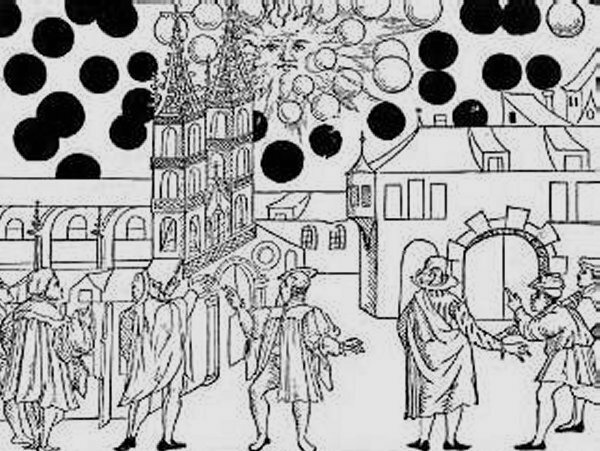 Woodcut from Basel, Switzerland, 1566. It would be highly unlikely for all members of the crowd to see anything closely resembling the primer’s description unless it were a highly detailed one, but the crowd would naturally, through shared discussion of the event, correct for discrepancies in accounts of the hallucinated imagery. Knowing what we know about the fallibility of human memory and our natural tendency to align our memories with those of others, it is not hard to imagine how a few hundred conflicting memories could be gradually harmonized over successive retellings. Thus what allows the collective hallucination to really take hold in the crowd mind is not so much the witnesses’s failure to perceive what’s really there at the time of the sighting, but their failure to correctly recall the details of the sighting after it had already taken place. But it’s important to remember that collective hallucinations, at least as Zune and Jones define them, take place under very specific circumstances, and take their strongest effects long after the hallucination takes place. Not all anomalous observations occur under these conditions, and many are reported in such a way as to nullify the full effect of distortions through collective recall. Although the Phoenix Lights eventually spawned a media frenzy, police, news stations, and reporting centres received hundreds of calls before any of the news had gone public. Nearly everyone reported the exact same thing, at the exact same time. This assures us that the witnesses did not unwittingly converge their accounts in discussing it with each other. The crowd model of mass sightings can’t be applied in all cases. It’s also important to remember that collective hallucinations have not been demonstrated through any kind of scientific process, experimental or otherwise. The whole theory rests on flimsy epistemic foundations. It is an extrapolation of the better-understood concept of hallucination without any unique data to back it up. 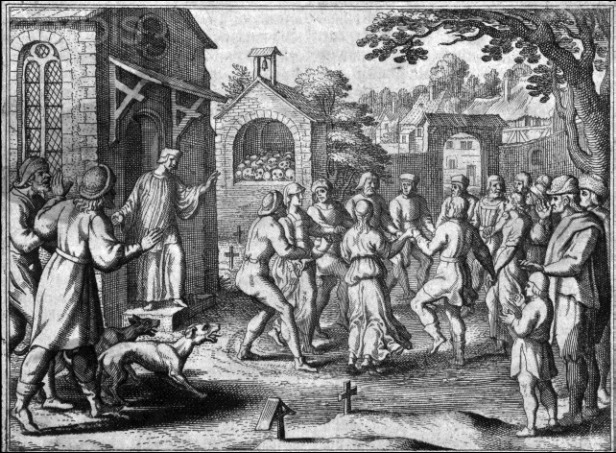 Mass Hysteria can explain instances of shared behaviours like the Dancing Plague of Strasbourg, France, 1518, but it can't account for shared visual hallucinations. Again in this case, though many claimed to experience bodily symptoms with no discernible cause, no-one claimed to see or hear anything that wasn't actually there. Our bodies and nervous systems seem to have ways of reproducing the experiences of others around us; our perceptual systems do not, at least not nearly to the same extent. The mass hallucination theory: straw man, or honest confusion? That “collective hallucinations” are so weakly supported in the psychological literature has led Mesner to question if the “mass hallucination” theory isn't just a straw man argument employed by anomalists to make the only assumed alternative explanation - that the observations were true to reality - seem like the more rational choice. I’m sure Mesner’s statement is at least partly correct. However, it has also been my experience that the mass hallucination theory is invoked more commonly by those who take a debunking position on a topic, but who also don’t necessarily understand the limitations of the collective hallucination theory. Whether it’s used as a straw man or just confused with similar concepts like mass hysteria, there just isn't enough scientific support for such things as mass hallucinations to accept them as a definitive explanations in any particular cases. Good explanations for anomalous phenomena are built on good science and robust theories. The mass hallucination theory, in any name or form, is neither of these things. In many cases, explaining group sightings as mass or collective hallucinations is about as speculative and ultimately pseudoscientific as explaining them as UFOs. It is not a more “rational” alternative to any supernatural explanation, and it should not be accepted as the default explanation for multiple-witness accounts. (4) Leonard Zusne and Warren Jones, Anomalistic Psychology: A Study of Magical Thinking, 2nd Ed. (New York: Psychology Press, 2014), 114-118 and elsewhere. (6) Also noted by Zusne and Jones, 118. (7) Lynne D. Kitei, The Phoenix Lights. Charlottesville, VA: Hampton Roads, 2010.